The actual celebration of Janmashtami takes place during the midnight as Sri Krishna was born on a dark, stormy and windy night to end the rule and violence of his uncle, Kansa. All over India this day is celebrated with devotional songs and dances, pujas, and aarti. 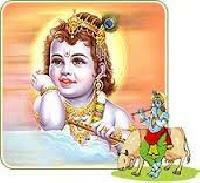 Lord Krishna was very fond of butter as a child, hence, he is also known as Maakhan (Butter) Chor (thief). He used to steal butter from villagers accompanied by his friends.On this day, devotees keep day long fasts and chant bhajans (religious hymns) till midnight when Lord Krishna was born, followed by prayers.An idol of Lord Krishna is bathed with panchamrit by the priests along with chanting of holy mantras. Panchamrit used to bathe Lord Krishna idol is made up of 5 things viz milk, ghee (clarified butter), curd, honey and holy water from the holy Ganges river. A conch shell is used to pour the panchamrit for bathing the idol. Festivities begin before dawn and extend all day until midnight, the exact moment of the anniversary of Krishna appearance. Events include kirtan, singing the Lord name along with other devotees. Some devotees cook a feast of over one hundred dishes, while others perform drama and dance. Janmaashtami is called as Dahi Handi in Mumbai and Pune. 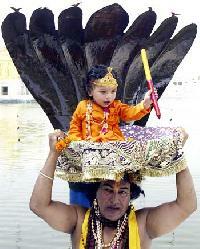 The Krishna Janmashtami over here is celebrated with a huge fervor and passion. The handi (dahi handi) is basically a vessel full of buttermilk. This vessel is tied on a rope high above the ground.Now on the day of the Krishna Janmashtami or the Dahi Handi festival, the boys of the locality together form a man pyramid, in order to reach till the height of the dahi handi and then the topmost person breaks the handi with a coconut as coconut is considered holy in the Indian Mythology, then the buttermilk (dahi) is dripped over the whole man pyramid.The group of the man pyramid is called as Govinda Pathaks. There are several Govinda Pathaks groups within a city all of them compete with each other as there is a competition of how many handis would a group break. The place of the birth of the Lord Krishna Uttar Pradesh or Mathura celebrates the festival with a lot of zeal. The place where Lord Krishna used to play in their childhood, the Gokul and the Vrindavan receives the maximum crowd during this festival.The celebration of the festival lasts for more than a week. This preparations for this celebration of the festival starts a week before the festival. People from different places come to visit and become a part of the Krishna Janmashtami. The festival marks its presence in Gujarat at the city Dwarka where the Dwarkadhish temple is located. Every year the Dwarkadhish temple celebrates the Krishna Janmashtami with pomp and delight.As the lord Krishna is much revered in Gujarat, many people keep the idol of the Lord Krishna within their houses and celebrate the Krishna Janmashtami with their family members. Jammu celebrates this festival with a special touch. Kite flying is considered as an auspicious omen on the day of the Krishna Janmashtami. Apart from kite flying, special dishes are also made on this day and are rejoiced by all. In the eastern states like the Orissa, West Bengal and Puri public rejoices this festival with high rituals. People go on fasting and do puja at midnight (as the Lord Krishna was born on the stroke of Midnight).The next day to the Puja is known as Nanda Utsav. On this day Nanda Maharaj and the Yashoda Maharaani are revered and the fast is broken after eating something sweet. In Karnataka special preparations for this festival are done in advance. The idol of the Lord Krishna is uniquely adorned with special clothes and ornaments. Bhakshanam, a special dish is made and offered to the Lord as it is considered to be the Lord beloved food. Fruit salad is also served along with this.Even other food which has been stated in the scripts is served to the Lord Krishana. Like avalakki, which Sudhama (Krishna friend) and Krishana used to eat together. The festival has its same culture even in today era. Time has just changed the way of celebrating.Like earlier the people of a particular locality themselves used to break the dahi handi, which now the Govinda Pathaks break.This festival now marks the presence of the Indian mythology, which now seems too lost in the huge crowds of this new generation.